At Hennion & Walsh, we tend to view investments in gold not only as a potential inflation hedge (recognizing that shorter term inflation forecasts remain muted presently) but also as an equity market volatility hedge. The latter in a similar fashion to the way that investors traditionally have gravitated towards fixed income investments when equity markets are volatile, or depressed, these same investors now seem to be increasingly looking to precious metals (gold and silver included) to help not only from a diversification standpoint but also to assist with total return potential given the record low interest rate environment that fixed income investments find themselves within currently in the U.S..
1) Volatility of commodity investing in general, and gold in particular, due to the great number of institutional and retail investors entering the gold investment market in the past 4 years. 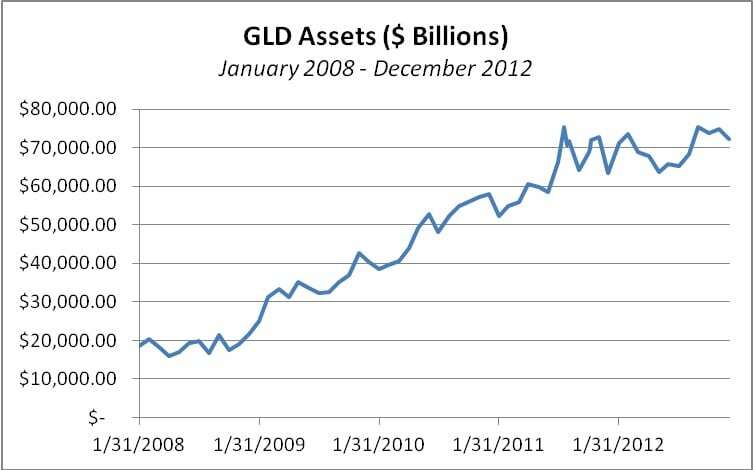 Please see chart below for the Exchange Traded Product (ETP); SPDR Gold Shares (Ticker: GLD), which shows the asset growth in this product from the beginning of 2008 through the end of 2012, as evidence of the growing popularity of these types of “user-friendly” gold investment vehicles. Data Source: Bloomberg, January 11, 2013. Past performance is not an indication of future results. To better understand what makes the price of gold move, upwards or downwards, it is perhaps best to appreciate the relationship gold has had to the U.S. dollar historically. Prior to 1972, there was a direct relationship between the U.S. dollar and gold prices whereas each dollar was backed by claims for a specified amount of gold (i.e. the “Gold Standard”). When President Nixon removed our currency from the Gold Standard, the dollar no longer had a direct relationship with gold – or anything else for that matter. Instead, gold now has an indirect relationship with U.S. Dollar as the price of gold in U.S. dollar terms changes as a result of a variety of economic and psychological factors. Given this relationship, absent tremendous global market stress, gold generally tends to move in an opposite direction from the U.S. Dollar, or more specifically, the U.S. Dollar index. In other words, as the U.S. Dollar increases in value, Gold, in turn, decreases in value and vice-versa. Given the low interest rate environment in the U.S., the U.S. Dollar has been weak against other foreign currencies in recent years, which, in addition to the other factors previously discussed, has helped fuel a rise in the price of gold since the great market meltdown of 2008. However, in the past year, as other foreign currencies have weakened in relation to the U.S. Dollar, the price of gold has pulled due to the relative weakening in conjunction with other market factors. The value of the U.S. Dollar, and its effect on the price of gold, for 2013 will be largely influenced by the upcoming 2nd round of Fiscal Cliff decisions related to spending cuts, the impending Debt Ceiling decision and further Federal Reserve actions related to interest rates in response to the ongoing, sluggish economic recovery. As a result, it is our contention that an client risk tolerance/investment objective appropriate allocation to precious metals is worthy of consideration for 2013. *It should be noted that at present, Hennion & Walsh Asset Management has allocations within its managed portfolios to PowerShares DB Precious Metals (Ticker: DBP), which itself has allocations to gold and silver respectively.